Animal Rights: Take a simple look at how the animal kingdom works, and then revisit animal rights rhetoric in a new light. ...if they can catch them. Probably not the kind of rights some have in mind. Are people animals? 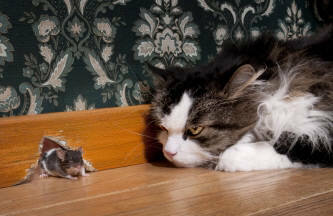 Not all of us consider ourselves to be just another animal, but if you do, welcome to the world of predation. It’s been this way since the dawn of time. It is how nature works when it is in balance. Animals don't give animals rights in the animal kingdom. Antelopes aren’t equal to lions. Lions don’t stop for even one second and ask, ‘If I eat that antelope, will I violate its rights? Will I rob it of freedom?’ NO! Its cubs are yowling for steak dinner, and its own belly is growling. 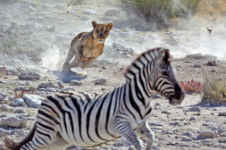 Animals prefer NOT to get eaten, hence THE CHASE. As we watch antelopes dash away from lions on the Discovery Channel, we cheer for whichever animal ‘wins.’ We’re happy when the antelope escapes to get caught and eaten another day, and we’re happy when the lion catches and kills the antelope, because the bellies of the cubs will swell with much-needed nourishment. 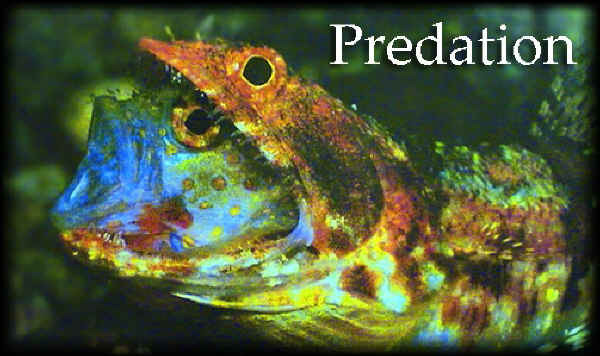 Predation is ingrained in the DNA of every living creature, including humans. All indigenous people-groups have been meat eaters, at least in their earliest history. Throughout history the survival of mankind has hinged on the meat, fur, and sinews of animals. It is in the psyche of humankind, even yours. Prohibitions against eating animals frequently stem from religious sources. There is a people group today that is vegetarian, but it is their religion, not their nature, that, for good and just as often for bad, prohibits the eating of meat. "...Hypocritical liars...who order [people] to abstain from certain foods, which God created to be received with thanksgiving by those who believe and know the truth. For every creature of God is good [to eat], and nothing is to be refused if it is received with thanksgiving..." (First Timothy 4:2-4 -- Holy Bible). We think there's much more to the rhetoric about animal abuse and rescue, etc., than any activist wants you to know, and it, too, smacks of religious fervor. We're fairly confident that, when all is said and done, animal rights campaigns have absolutely nothing to do with bettering the condition of animals. Some activist factions are determined to prohibit all human uses of animals for any reason whatsoever. They call themselves "Animal Abolitionists." That means no dogs, cats, rabbits, cows, sheep, horses... No zoos. Nothing. And you? You get to eat tofu, veggies, and garbanzo beans. Veganism is the only eating choice for humanity, a point held religiously. Animal Rights activists cringe at the idea of animal welfare because just being nice to animals is not part of their plan. They want to take animals away from people entirely. It takes huge effort and expense to stay healthy on a vegan diet. Pictured is a Peruvian woman with a valuable young lamb. While mountain dwelling Incan Peruvians such as this woman have animals, they are so poor that they almost never eat them. Rather, they grow and eat potatoes. Fried, boiled, and baked. Nothing but potatoes, eaten carefully so as to pick out the worms first. (Not sure why they pick out the worms, but they made me do it too.) They grow just barely enough potatoes to last them until the following year's harvest. Only during occasional celebrations do they slaughter a goat, cook it in a hole in the ground (it's called "punchamunka" in Quechua, and it tastes amazing), and share the one animal among many people. Potatoes by themselves will support life, just barely, but they do not provide enough protein or calories for optimum health. As a result, many generations of the entire Incan people-group have grown up with the resultant nutrient deficiency disease, kwashiorkor, that leaves its victims mentally deficient, and up to 50% of Incan children under 4 years old die of disease and malnutrition. True veganism leads to another deficiency - Vitamin B12 deficiency, which eventually results in neurological problems and then death. No, vegan diets are not only NOT ideal, they are dangerous, most especially when you don't have the capability or the means to make the myriad dietary adjustments that must be made when you forego eating animal-based nutrition. Many societies across the globe rely upon their herds for sustenance, without which they would starve to death. Pictured is a herd of goats in Mongolia. The geography and weather do not lend themselves to growing grain, but the environment there is perfect for goats. Plenty of animal rights activists get all worked up over barnyard animals. They think ANY use of ANY creature is a robbery of the animal right to freedom. Do you realize that sheep cannot survive in the wild without people to look after them? There is no ‘wild’ in them, and never was. They have no natural means of self defense, and they are too stupid to fend for themselves. Besides, who would shear them? Without shearing, they will die. In the Garden of Eden, God made tunics of skin for Adam and Eve (Genesis 3:21). I don’t know if Adam and Eve had steak for supper that night, however it is clear that at least one animal died at God’s hand so He could give its skin to humans. I have no reason to doubt that God acted in a supremely humane manner. Abel, the second son of Adam and Eve, was a sheep rancher by trade. It is certain that sheep needed a shepherd from the earliest days, and that mankind continued to herd and use sheep (and other animals) for various reasons from the outset of known history. Animals are animals. Animals are NOT people. Animals don’t have ‘rights,’ or an intrinsic right to life. The Farm Animal Welfare Council (UK) has codified what animal experts call the '5 freedoms:’ Freedom from hunger or thirst, freedom from discomfort, freedom from pain, injury or disease, freedom to express (most) normal behavior, and freedom from fear and distress. If you’re kind to your animals, chances are you’re already automatically and generously providing at least these ‘5 freedoms’ to your animals. God gave animals to people to use for food and for clothing. Animals have morally served the needs of humans for millennia, and it will be just fine as they continue to serve others' needs. Butchering is not a violation of kindness, when done humanely. We owe it to God to treat animals with kindness as He does, use them wisely as He would, and ensure minimal suffering on harvest day, as He did. Humans need to manage their herds and barnyards with wisdom and respect. The existence of large farming enterprises does not negate the right of humans to own and manage animals wisely. Don’t accept the ‘be-a-vegetarian-for-the-sake-of-the-animals’ guilt-trips. If you want to be a vegetarian, be one for honest, not guilt-ridden, reasons. Place blame where blame needs to be placed. Don’t appreciate large farming enterprises? Well then, don’t purchase your food from them. DO purchase from mom-and-pop family farms where the animals have been treated kindly and harvested humanely. We realize that not all people will share our viewpoint. 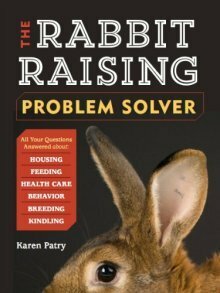 Nevertheless, our goal is to encourage and support all those who are wisely and kindly breeding and raising rabbits (and other animals) for meat, pets, show and fur. Maybe you have an opinion about animal rights? We know this page is fairly opinionated, so we'd like to know what you think. What are your feelings about animal rights...animal welfare...doing away with all uses of any animals whatsoever...? Do tell, but do keep it courteous...and thanks for sharing!